When the event, Kcon, was first held in the U.S. in 2012, it drew a few hundred fans and curious locals. That number has since swelled to more than 125,000, divided between conventions on both coasts. “The chanting was so loud last time that mainstream music industry people told me they’d never heard the roof blown off like that before,” says organizer Angela Killoren. The event’s popularity coincides with the worldwide explosion of K-pop, which has swelled in the past five years from a niche genre to a $5 billion global industry. K-pop’s takeover of the West will be cemented on October 6th, when the seven-member Seoul crew BTS becomes the first Korean group to play a U.S. stadium, at New York’s Citi Field. The show, which sold out in minutes, follows the success of the group’s hit “Fake Love,” which debuted at Number 10 on Billboard’s U.S. Hot 100 in June and racked up more than 35 million YouTube views in its first 24 hours, surpassing Taylor Swift’s “Look What You Made Me Do.” BTS’ LP Love Yourself: Tear, released in May, debuted at Number One on the Billboard 200, moving 135,000 copies in its first week. Fans of Korean pop music attending Kcon, a convention that brings together some of the most popular pop bands from Korea, on June 23, 2018, in Newark, New Jersey. The convention has been held annually in North America since 2012. The answer may be that those groups tried too hard and too soon to appeal to a global audience. Both Wonder Girls and Girls Generation recorded English-language versions of their hits, which failed to take off. BTS, meanwhile, have continued singing in Korean while embracing Western pop in other ways. 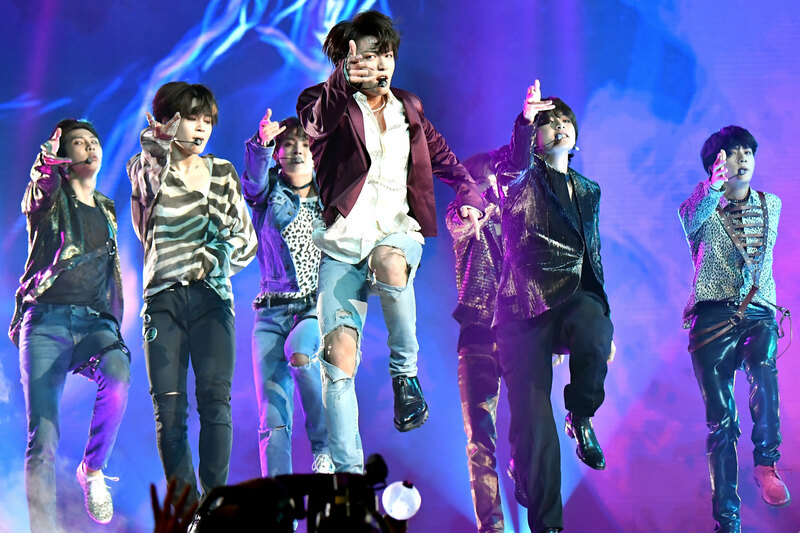 “The music of ‘Fake Love’ was so good that you can listen to it and like it and not even care about the lyrics,” says Leslie Whittle, radio program director at Houston’s KRBE. BTS’ first Top 10 album, last year’s Love Yourself: Her, featured songs written with the Chainsmokers. The group has since released collaborations with Steve Aoki, Zedd and Ali Tamposi (who co-wrote Camila Cabello’s “Havana” and Kelly Clarkson’s “Stronger”). On Soompi, one of the biggest online K-pop communities, active since 1998, the vast majority of fans are not Korean (the same goes for Kcon’s attendees.) But its users — 22 million and growing fast — spend hours translating lyrics and analyzing K-pop’s notoriously intricate music videos, which are crammed full of plots including but not limited to murder, familial betrayal, dream sequences, heartbreak and time travel. “A lot of it is very visual,” says Kristine Ortiz, a community manager at the company that owns Soompi. “They’re able to create a sensory experience through clothes and music videos with elaborate story lines. That’s not seen a lot in Western music.” The fans who do understand the language decode interviews with artists. Language isn’t so much a barrier as it is a point of entry: “In Korea, it’s already a part of the culture, and they speak the same language,” says Ortiz. “In the U.S., it’s a process of self-discovery and that makes it really exciting for fans. Users find one song and they start digging on their own. There’s a level of motivation and socializing you don’t see with American artists.” Some fans, she says, even wind up learning Korean as a result. South Korean girl-group Blackpink pose as they arrive for the Asia Artist Awards 2016.